Heavy rain overnight and torrential downpours in the early morning pushed the start of the final round of the 2019 AT& T Pebble Beach Pro-Am back one hour, to 8:49 a.m., and yet another heavy squall passed through the area about an hour into play—but Mother Nature wasn’t finished yet. The unsettled air trailing behind the low pressure system that moved through the area in the morning brought with it a brief but powerful burst of wind and hail, the icy pellets covering a number of the greens at Pebble Beach Golf Links in a snow-like blanket of white. Play was suspended at 10:53 a.m., and the players brought in from the course, with all the delays that entails, and play re-commenced at 1:00 p.m.
Blue skies dotted with fluffy, picture-perfect cumulus clouds prevailed for the remainder of the day, as four-time AT&T Pebble Beach Pro-Am champion Phil Mickelson embarked on his pursuit of three-stroke leader Paul Casey, and a shot at tying Mark O’Meara’s five-victory record at the storied seaside venue. Mickelson moved to within a stroke of Paul Casey with a birdie at #9, one of the storied stretch of par-4s – 8, 9 and 10 – which Hall of Fame golf writer Dan Jenkins has dubbed “Abalone Corner”. More birdies, at 13 and 14, pulled Mickelson to a three-shot lead as Casey carded two bogeys, two pars and one birdie, at 14, over the same stretch. After splitting the 15th hole with pars the leading group played to the green at #16, where Mickelson finished the hole, but Casey, with his eye on the rapidly diminishing light, marked a 3-foot putt. Play was called at 5:55 p.m. Pacific Time; the leaders were left with two holes to play, with play to resume at 8:00 a.m. Pacific Time, Monday morning. Coming back Monday morning to clear skies and freshly-mown and rolled greens, Casey rolled in the three-foot putt on 16, and the group moved to the 17th tee. Casey’s most realistic hope for the conclusion of the round was to make a birdie on at least one of the final two holes, breaking the tie with Scott Piercy and claiming a solo second place finish. With a generously sized gallery on hand for an early-morning two-hole finish, Casey and amateur partner Don Colleran joined Mickelson on the 17th tee. Mickelson, having the honor, played first, stuffing a 7-iron shot to within eight feet of the pin, on the left; Casey answered with a similar shot, to the right and above the pin, and just a little closer than Phil. Neither player converted their nervous little seven-to-eight-foot birdie putts, halving the hole with pars. Mickelson opted for the conservative option off the tee, playing an iron to the right fairway, and another for his second shot to leave himself 138 yards to the center of the green. Casey took driver off the tee, 283 yards to the right intermediate rough, followed by an iron to the left intermediate rough, just off the green, his ball nestled up against a sprinkler head. Mickelson’s third shot from the fairway left him a 6-1/2-foot putt for the win; in the meantime, Casey took relief from the sprinkler head, testing the new knee-high drop rule, and putted past the hole to leave a 7-foot comebacker for birdie. Casey rolled in his putt, cementing solo second and a win in the pro-am event for himself and partner Don Colleran, and clearing the stage for Mickelson, who stroked in the winning putt with no more drama than if it were a tap-in for a $5 Nassau. 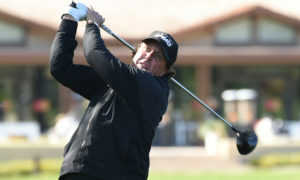 The win in the 2019 AT&T Pro-Am marks 44 wins for Mickelson, and his first win on U.S. soil in six years – his most recent victories coming at the 2013 British Open and the WGC-Mexico Championship in 2016. In other notable results, former Cal men’s golfer Max Homa, starting on #10 at Pebble Beach, made birdie on the par-3 12th hole, and recovered from a double-bogey on the 13th hole with birdies on the two daunting par-fives on the back side, 14 and 18 to go out in 35. Midway into his second nine Homa had moved up to T-9, after birdies on the first, third, fourth and sixth holes; he parred in, and was sitting at T-11 when he finished his round. In one of those quirks that often rule the game of golf, Homa moved up to T-10 without touching a club after Scott Pierce, finishing the 18th hole in near-total darkness, made bogey, dropping from T-7 to T-10, and simultaneously boosting Homa and Michael Thompson to T-10. The Top 10 finish gives Homa entry to next week’s event, the Genesis Open, at Riviera Country Club near Santa Monica – a boon for the Valencia-California native, who would not otherwise have had a path into the field. Sacramento’s Cameron Champ, also playing Pebble’s back side as his first nine, equaled Homa’s feat on the par-3 12th hole, but made bogey on the long, right-bending par-5 14th when he cut the corner too tight with his drive and landed in the last bunker on the inside of the turn. A poor angle left him with no shot at the green, and after getting on in three, he three-putted from the far right side for a bogey six. Finishing his first nine at even-par 36 after another bogey at the par-4 16th hole, and a birdie on the iconic par-3 17th, Champ headed into the second half of his round T-48. Champ made birdies on #2 and #7, the dramatic little par-3 on the tip of Arrowhead Point, and closed out his round with a chip-in birdie 3 on #9, the most difficult par-4 on the course, to move up 19 spots on the leaderboard, finishing T-28. In the pro-am competition, the team of Sacramento native Nick Watney and amateur partner Julie Frist finished T-10, while pro Ryan Armour and San Francisco’s Kira Kazantsev, Miss America 2015, came in at T-18.